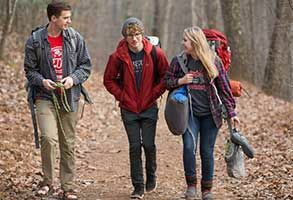 Take a break from your studies and enjoy all that Liberty University has to offer – outdoors! 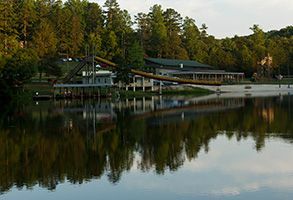 Camp, kayak, and even fish at the Hydaway Outdoor Recreation Center (formerly Camp Hydaway) located less than 5 miles from the Liberty University campus. 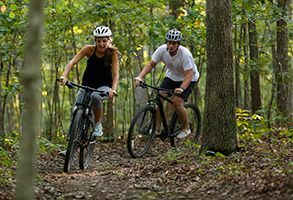 Run, hike, or bike on our expansive trail system. In the mood for adventure? Take a short getaway with us on one of our guided outdoor trips or compete in one of our trail races. Our sandy beach and designated swimming area provide a perfect opportunity for all your lakefront fun. Swim, kayak, fi­sh, and more. Take the challenge and run in the Liberty Mountain Trail Series. 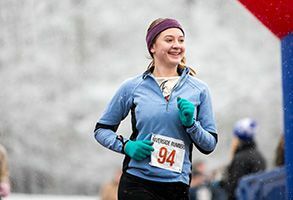 Races are held in both fall and spring semesters on the Liberty Mountain Trail System. Run our half-marathon, 5-mile, 2-mile, and 5k courses or our 1-mile uphill sprint. Adventure with us on an outdoor trip guided by our experienced trip leaders. Trips include horseback riding, kayaking, hiking, whitewater rafting, camping, skiing, fly fi­shing, and rappelling. Reserve your campsite complete with fire pit on a Friday or Saturday nights. Our 8 campsites are located on the outskirts of Lake Hydaway. 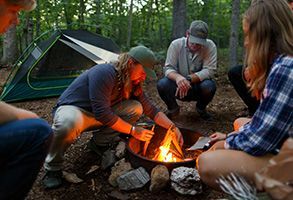 Your camping gear comes free with your site reservation! Enjoy over 50 miles of single and double track trails as well as logging roads that span approximately 5,000 acres. Great for cross country running, hiking, or biking. Reach beyond your limits and try something new with one of our Challenge Courses. Low and high challenge courses offer a supportive and exciting team experience for students, faculty, and staff. 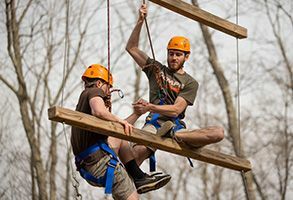 We provide outdoor trips, trainings, and other events for our students- including the Hydaway Outdoor Recreation Center. We seek to engage the Liberty University community by providing diverse outdoor experiences that foster biblically minded social, physical, and educational development.